set in the palette which runs along the top of your screen. This palette changes according to which tool you have selected. 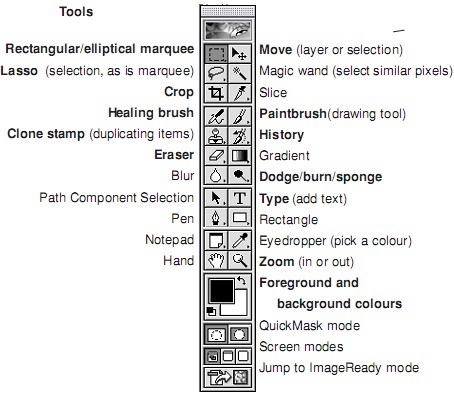 Photoshop. You can undo any number of steps by clicking on the white tab for which-ever change you wish to go back to. the Foreground colour by default. default, or the original background if you hold down the Option/Alt key. 1 Double-click the Foreground or Background colour box. 2 Select a different colour from the narrow vertical strip in the window. 3 Click on the shade of that colour in the large box or enter the pantone number. 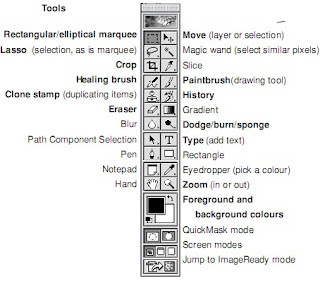 The mouse is an integral part of Photoshop and to make the most of Photoshop, users must be confident in their mouse use. mouse is then pointed at a part of the image and the mouse button is clicked once. to “pick up” a sample of colour for use elsewhere in the image. *On some Mac keyboards, the option key is known as the Alt key. Any erase operation you do in Photoshop will use the Background colour by default, or the original background if you hold down the Option/Alt key.